October 5, returning from Serifos. Rebecca gave me an adventure for my birthday. 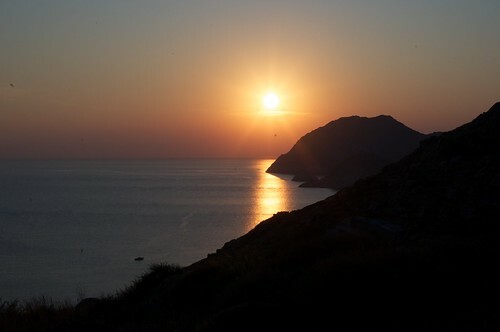 Just after midnight, she gave me an envelope with tickets to Serifos, a very small island. We went for a day trip on my birthday, and rented a scooter. It was also a great chance to use my other present, a pancake lens for the Pentax. All-manual, it was the only lens I brought. I needed noting else. We saw the island's lovely chora, another hilltop town with house upon house and only narrow pedestrian walkways and stairs between them, high upon a hill, overlooking but quite far from the contemporary port. Typical pirate-resistant town planning. We went to the Moni Taxiarchis, reputedly a monastery with only one monk. 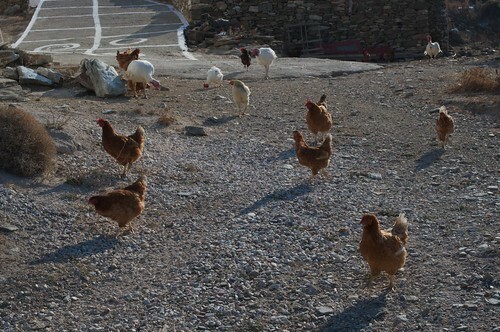 It was not open to visitors when we arrived, but we were chaperoned by some confrontational poultry that presumed we were a source of food. The adjacent church and surrounding cemetery was, however, open. And so was one other building, that looked like a church from the outside: an ossuary! Floor to ceiling, small boxes with names and dates of death or internment or exhumation, presumably holding the bones. From there, we jetted off to the site of the old mines and reputedly the good beaches. After a bogus detour to the dump, we found our way over dirt roads and barely-roads to a path, where we were able to walk down to a small, sandy beach where we were the only visitors, despite a very recent-looking improvised campsite. The beach had many rocks formations of interest, and we enjoyably climbed over them, peering into tide pools. We walked back to the bike just before sunset, rode back to the port, ate a good and surprising Italian meal with gusto, and then it was back aboard the ferry at 20:10 (only 5 minutes late, or Greek Early). A wonderful day. 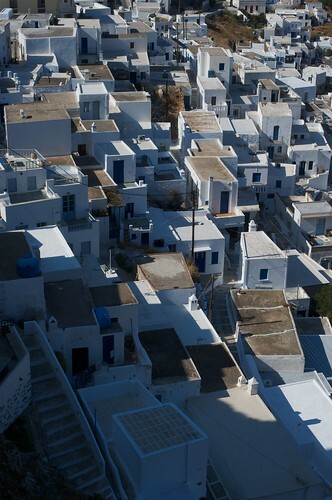 (Many more Serifos photos here, plus a bunch of other Greece and Montreal pictures.